As an aspiring young developer, you may be thinking about learning a new programming language. However, it can be quite difficult to decide what the best programming language to learn is. Although different people will tell you different things when it comes to the best coding language to learn, the reality is that it will depend on your personal situation, your goals, and what you want to get out of it. This guide should help you decide which programming language to learn. Each of the major languages is outlined according to its popularity, use cases, demand, and ease of learning. The market demand and potential salary range for each language is noted, and they are linked to specific personal goals and prior coding experience. 1 Why Should I Learn A Programming Language? 2 What Is the Best Programming Language to Learn? 3 So, What Are the Best Programming Languages to Learn? Why Should I Learn A Programming Language? There are many reasons to learn a new programming language. For most people, a new language will allow them to further their career and get a better job. For others, learning a new language is nothing more than a hobby, and the best programming languages to learn will depend on what they enjoy. Learning even just one language will make you much more employable. In the modern age – the digital age – being able to write code and create programs looks great on your resume, even if you don’t work as a programmer. It can help improve your attention to detail. Learning a new programming language requires a huge amount of attention to detail and precision. Even one line of code out of place can be enough to ruin an entire block. It could open up freelance job opportunities. Freelance programming is becoming a seriously large business. Some sources claim that freelance programmers can make upwards of $100 an hour – money that no one could say no to. 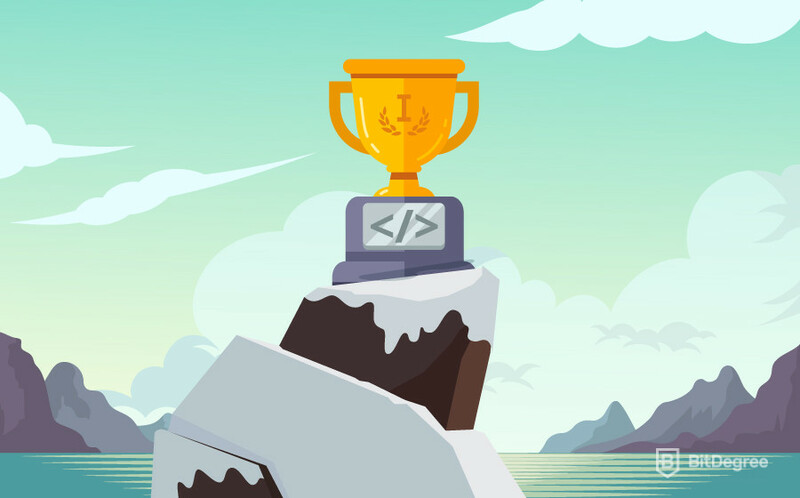 With this in mind, let’s find out how to choose the best programming language to learn. Your personal goals: What do you hope to get out of your new language? If you are looking for a career change, then consider a language which is in high demand and which pays well. However, if you are looking to add to your current skill set, you should consider a language which complements your current knowledge. Your programming experience: Some languages are a lot easier to learn than others. If you are a beginner trying to find the best programming language to learn first, consider something that is both simple and popular like Python or Java. Both of these are relatively straightforward and fun to learn. What you want to do with your language: Different languages are designed for different uses. For example, Solidity is used in blockchain development, Swift is used in IOS programming, and Python is a general program which has a variety of uses. Now that you have an idea about what to think about when deciding on the best programming languages to learn, it’s time to take a closer look at some of the more popular languages. As far as choosing programming languages to learn goes, there are a lot of resources out there for people who are thinking about learning Java. It was released in 1995, making it one of the oldest programming languages. Java is used on a wide range of platforms and operating systems, including Microsoft Windows, macOS, Linux, and Solaris. This means that there will always be jobs out there for Java developers, making it (arguably) the best programming language to learn first. According to recent statistics, a Java developer can expect to earn anywhere from $80,000 to $130,000 per year. Of course, the higher end salaries are usually snapped up by programmers with years of experience, but even inexperienced Java developers can earn pretty decent money. If you are thinking about learning your first programming language, consider signing up to BitDegree’s Learn Java 101 course. This course, which contains 40 lectures, will teach you all the basics that you need to know to start programming with Java. It is designed for beginners who are looking for new programming languages to learn. It is easy to follow – even if you have no programming experience – and is definitely worth looking at. PHP is another older language, first hitting the programming scene around the same time as Java in 1995. It is a general-purpose scripting language which is widely used for web development. One of the distinctive features of PHP which make it the best programming language to learn for some people is its compatibility with HTML code. Unlike other languages which can be rather difficult to use with HTML, PHP can be embedded directly into a block of HTML code. Start and end processing instructions are used to jump in and out of PHP mode, which makes it a very easy language to use. Again, the popularity and widespread usage of PHP mean that career opportunities and jobs are relatively easy to find. The average PHP developer can expect to earn around $80,000 per year, but there is the potential to earn significantly more as a freelancer. 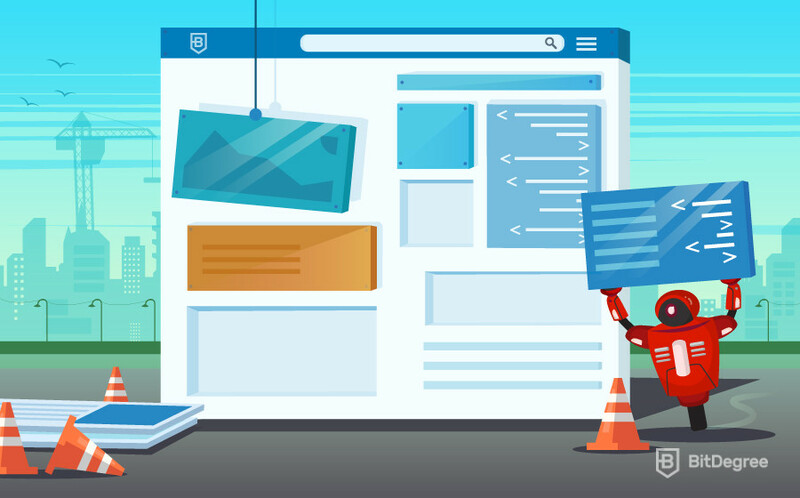 Take an in-depth PHP course which will walk you through everything that you need to know to land your first programming job. 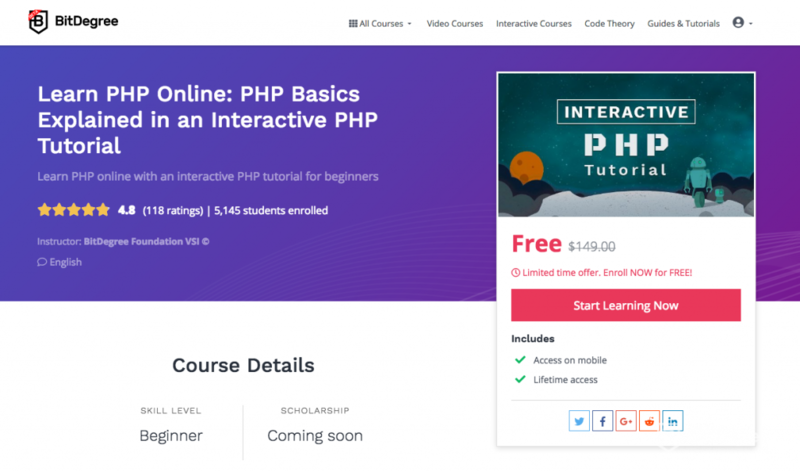 It doesn’t matter if you are learning your first language or are an experienced developer looking for the best programming language to learn to add to your resume – PHP is a great choice! Python is quite a simple programming language which is very easy to pick up if you already have a programming background. This makes it one of the best programming languages to learn if you are already working as a developer and are looking to boost your resume quickly. Python code is designed with code readability in mind. It uses a lot of whitespace, which makes it quite an easy language to follow while you are still learning it. Python can be used for developing both desktop and web-based programs, which makes it a great language for generalist developers who work on a variety of projects. One of the most useful features of Python is its compatibility with data analysis and scientific applications. It is a popular language within scientific communities and is often used by researchers to write their own programs. The average python developer can expect to earn around $100,000 per year, but there is little room for wage growth. If you think that Python is the best programming language to learn to further your career, consider signing up to BitDegree course. 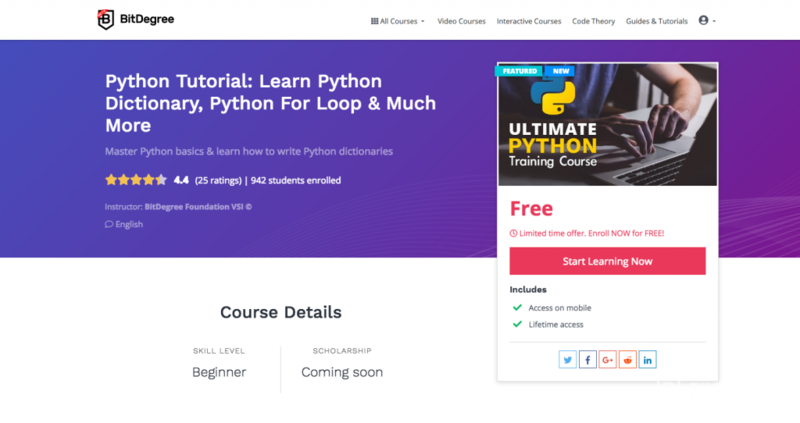 Python Basics course encompasses everything that you need to know to start writing python programs and contains just under 4 hours of lecture material. When you are looking for the best programming language to learn, you need to think about what sort of work you want to do. Over the past couple of years, cryptocurrencies – such as the well-known Bitcoin and Ethereum – have become increasingly popular. With this has come a rise in demand for blockchain developers. Solidity is almost certainly the best programming language to learn if you want to work in cryptocurrency smart-contract development. It is used to write smart contracts on the Ethereum blockchain, which form Ethereum-based DApps (decentralized applications). Solidity programming has become one of the most attractive programming languages to learn over the past few years. An experienced Solidity developer can expect to earn an average of $158,000 – way above the average wage for a developer in general. There is a high demand for good Solidity developers because the language is relatively new, so there are a lot of benefits to be gained if you can master it. BitDegree offers two Solidity courses – one for experienced programmers, and one for complete beginners. If you don’t have a programming background, but are interested in getting started, then look at the beginner Solidity Space Doggos course. However, if you already know one or more languages and are looking to add to your knowledge base, the advanced Learn Solidity course could be for you. SQL, short for Structured Query Language, is the most common and best programming language to learn for manipulating and querying data within relational databases. SQL first appeared in 1974, making it one of the oldest languages still in use. It contains a number of informal sub-languages, each of which is used to perform certain actions. SQL is quite a difficult language to use, and it has very specific use cases. However, the increasing demand for data analysis and manipulation by companies has resulted in a spike in the need for SQL developers in recent years. A thorough understanding of SQL will make you invaluable to any company with large databases of consumer information, which – when used properly – can inform marketing and strategy decisions. Although SQL is the best coding language to learn when it comes to data management, the average SQL developer is looking at a salary of around $70,000 to $80,000 per year. While good, this is lower than would be expected if you were to master almost any other language. However, SQL is a very good language to add to your skill set if you already know at least one other language. If you do decide that SQL is the best programming language to learn, you should consider BitDegree’s Interactive SQL Tutorial. This course consists of approximately 6 hours of learning material, as well as numerous practice exercises. The last language on my list, Swift, is by no means the least useful. It is a general-purpose language which was developed by Apple for use on their various operating systems. Swift is undoubtedly the best programming language to learn if you would like to develop or work with Apple programs and applications. Although it was only released four years ago, in 2014, the demand for Swift developers has grown exponentially. It is now one of the most widely used languages in the world, and your job prospects will be bright if you decide to learn it. Due to the high demand for experienced Swift developers, the average programmer who understands how to use the language can expect to earn in excess of $100,000 per year. This can increase once you have a bit of work experience under your belt. If you have thought about which programming language to learn and have settled on Swift, then BitDegree is the place to be. They offer two distinct Swift courses. The first is Beginner-Friendly Swift Tutorial, which is designed to give aspiring coders the knowledge they need to build iOS8 apps from scratch. The second Swift course, Learn Swift Programming, is also beginner-friendly and designed for programmers learning their first language. It teaches hands-on coding using visual elements. So, What Are the Best Programming Languages to Learn? Your programming experience because some languages, like Python and Java, are more suited to beginners who have never done any programming before. What you want to do with your language, because different languages are used for different things. How much time you have, because some languages require a much greater commitment than others.